Flashpoint Movie Won't Happen If Justice League Bombs? A new rumor suggests that the success of Justice League will determine if the Flashpoint movie gets off the ground. We've heard very little about the project since San Diego Comic-Con over the summer and even a few days ago when Jeffrey Dean Morgan was asked about playing Batman in the movie, the actor smiled nervously. A new report suggests that the search for a director has slowed down in an effort to see how well Justice League performs at the box office upon its release in a few weeks, which may or may not have been why Jeffrey Dean Morgan was so tight lipped about the project instead of practically giddy like he was over the summer. Variety reporter Justin Kroll recently sat in on the Meet the Movie Press podcast and suggested that Flashpoint as well as some of the other recently announced in-development DCEU movies could be put on hold until after the dust settles with Justice League. Kroll had this to say. "I've been tracking a lot of movies, pecifically Flashpoint. I've heard they've slowed their (director) search down to see how Justice League does. I don't know if they're giving everyone their own movie now. Aquaman's already shot so we'll see. Obviously (Cyborg) is not happening anytime soon, neither is Man of Steel 2... I've heard, 'Let's see how this movie does before we go forward with all those other movies." At the moment, the only DCEU movie set to come out in 2018 is Aquaman. It seems that Warner Bros. might be finding out the best way to approach their universe before making any huge leaps. 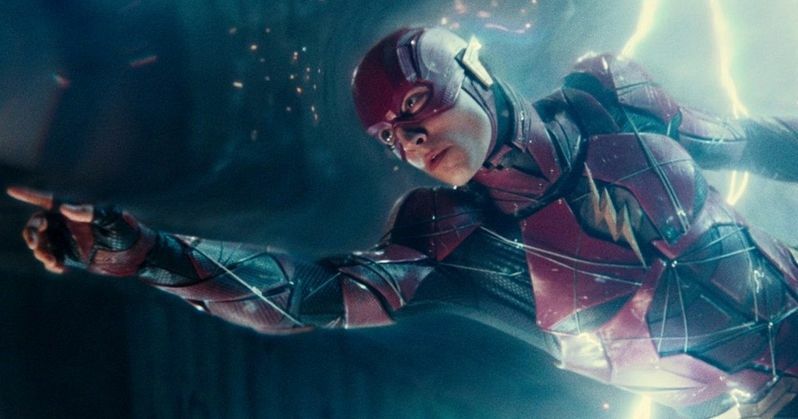 The Flash solo movie had been having a hard time, to say the least, with their director search, and a name that always came out on top was Back to the Future director Robert Zemeckis. Though nothing seems to be official yet, it seems likely that Zemeckis is Warner Bros.' top choice to make the Flashpoint movie. The fact that the movie has some time traveling aspects to it could also point to Robert Zemeckis, but as with the rumor suggesting that the movie is on hold until Justice League comes out, it's all speculation at this point. Warner Bros. will have a lot of time to think over their decision, though. Flashpoint is still years away. Shazam!, Wonder Woman 2, and Suicide Squad 2 are all expected to go into production in 2018. The recent announcement of the Deathstroke movie could be a way of proving the Justice League contingency plan to be false. At the same time, Warner Bros. has a reputation of jumping the gun when announcing DCEU projects, which is more than likely where the rumor sprouts from. Regardless, Flashpoint could also be put on hold because the movie may be used as a way to reboot the DCEU, which has been rumored since the start. So, as with all good rumors, it's best to take this one with a grain of salt and in the meantime, there's still Justice League, Shazam!, Wonder Woman 2, and Suicide Squad 2 to look forward to. You can check out the rest of the interview with Justin Kroll regarding the DCEU's future courtesy of the Popcorn Talk YouTube channel below.